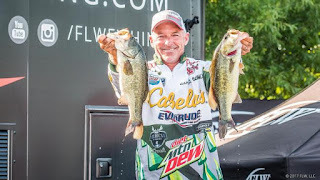 IBASSIN: 2017 Walmart FLW Tour Potomac River Day 1: Clark Wendlandt Leads with 19-11lbs! 2017 Walmart FLW Tour Potomac River Day 1: Clark Wendlandt Leads with 19-11lbs! Picking up right where he left off back in 2015 after winning on this same body of water, Clark Wendlandt claimed the lead Thursday on day one of the FLW Tour on the Potomac River presented by Costa Sunglasses, thanks to a healthy 19-pound, 11-ounce limit. Though his lead is a mere 5 ounces ahead of Tom Monsoor, Wendlandt has reinforced the notion that he’s in tune with this tidal system. Clark feeling comfortable in the lead on Potomac. “I have fished the Potomac for a long time, since 1996,” Wendlandt says. “My first three tournaments here were terrible. I couldn’t catch a bass. Then I just figured out how to catch them here and it’s hard to describe but I get a warm, fuzzy feeling fishing out here. Not that I think I am going to catch them, but I feel very confident. While the Potomac is possibly fishing better than ever, Wendlandt admits he couldn’t have pictured today starting out the way it did. During his win at the last Tour event here, Wendlandt worked a mix of docks, some laydowns and grass for the title. He also had the majority of Potomac Creek to himself. However, this time around it’s a whole different ballgame. Luckily for Wendlandt, he is a master at adapting on the fly. It explains why he does so well in the springtime when bass are moving daily, and also why for years he dominated on the ever-changing Beaver Lake. He is the textbook definition of an angler who trusts his instincts. Wendlandt realizes that starting from scratch is a must on fisheries like the Potomac. Weather – like wind – can help or hinder tides. Rain or wind can dirty certain parts of the river up and render them useless. He notes that he hasn’t even bothered to look at the weather because he doesn’t want to make a game plan until he starts fishing on Friday.